(i) They are an emerging supermarket chain with a focus on value- retailing. They opened the first store in Ahmedabad, Gujarat in 2014, in the name of “Osia Hypermart”. It works on the same economic model as other various retail showroom chains. The idea was pioneered by entrepreneur Mr. Dhirendra Chopra, the Promoter and Managing Director of the company. (ii) As on date, they have 11 stores with retail business located across various cities in Gujarat. 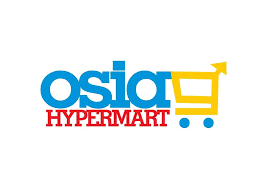 The Osia Hypermart stores have various divisions to meet the fluctuated shopping needs of customers. These incorporate Menswear, Women‘s wear, Kid‘s wear, Footwear, Cosmetics, Perfumes and Handbags, Household Accessories, lingerie, Gifts, Groceries, crockery, Handicrafts, utensils, handlooms, etc under one rooftop. The company stores have over thousands of products under a single roof that will cater to every need of a family and making Osia Hypermart public‘s favorite shopping destination with a modern ambience and with the feel of a large retail mall. (iii) Osia Hypermart is the destination where you get products available at prices lower than MRP, setting a new level of standard in price, convenience, and quality. The Company is also planning to trade Wholesale, which will boost-up the growth of the company and increase the scope of business and also Bulk trade with other retail stores The total concept and idea of shopping has undergone a vast drawing change in terms of format and consumer buying behavior, ushering in a revolution in shopping in India. IZ Review 1. The Company has shown excellent Growth in the last 3 years. 2. The Company will have a manageable D/E post issue. 3. The Company has shown excellent growth in EBITDA Margins. 4. 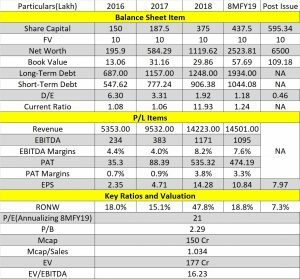 The Valuation in terms of P/E, P/B, and EV/EBITDA looks reasonable. 5. The Retail sector is quite promising and has all reasons to grow in numbers in the future. The peers shown are Avenue Super Market, V-Mart, V2- Retail which is currently trading at a very High P/E. However, the size and presence of peers are not strictly comparable with OSIA hyper Retail. Depend upon the Subscription figure we can bet on this. Hello!! Monarch comtrade is said to have been allotted 4 lac shares @ RS. 144 / apiece with no lock in. Is this true? Would they not sell heavily on the listing day? Is it safe to apply in this ipo? Please reply. The Company has 11 stores as on date and the company operates all of them. There is no franchise model as yet.